As a photographer, there will be many times when you will want a certain prop to fulfill a specific vision you have in mind for a photo shoot. Rather than spending a pretty penny on beautiful accessories, items, or outfits for your photography, it can be both cost-effective and fun to actually create them yourself. Today we’re going to share with you the most beautiful DIY photography props you can make with your own two hands. From stunning butterfly wings and mermaid crowns, to realistic clouds and everything else in between – we have a feeling you’re going to love these crafty ideas! 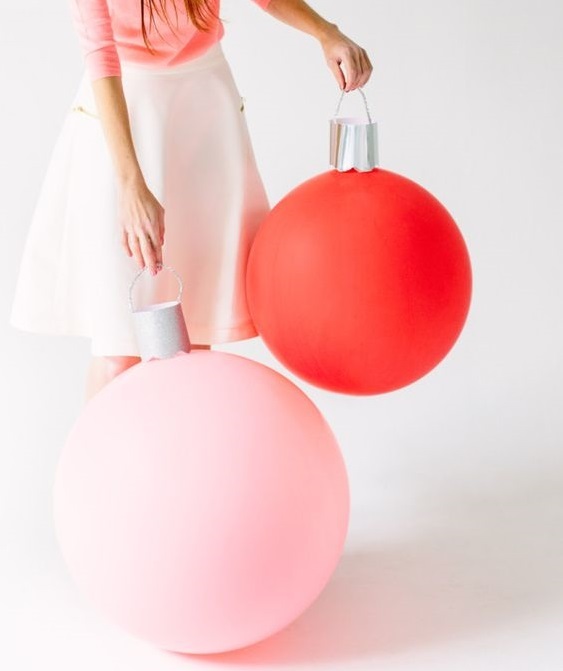 Studio DIY recently created these oversized baubles using giant balloons to decorate her place this festive season. These would make wonderful props for a Christmas inspired photo shoot and they’re incredibly easy to create. Using materials such as cardstock, pipe cleaners, hot glue, and 36” balloons, the good news is that you can actually grab these supplies at your local party, craft, or dollar store. In just a few steps, you too can create these fun and festive photo props! 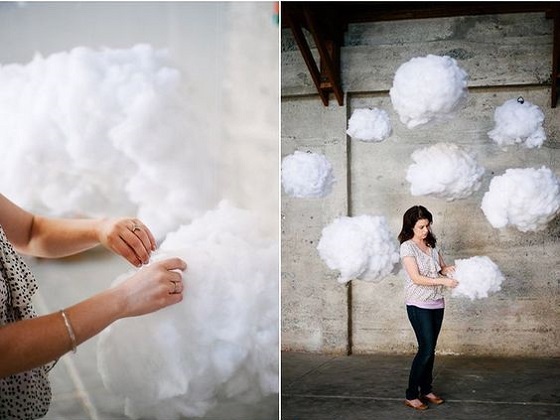 Perfect for special events such as weddings and engagements, or even to add a dreamy touch to your next photo shoot, these DIY floating clouds don’t just look great – they’re also quite enjoyable and affordable to make too! The guide on A Practical Wedding explains: “This takes pretty much no artistic skill to construct, just time and hot glue. 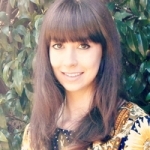 Anyone can do it,” so they’ve instantly won us over with this statement! Materials to make these DIY props include polyester stuffing, fishing line, a hot glue gun, and various-sized paper lanterns. The great news is that these items aren’t hard to source at all – in fact, you probably already have at least one or two lying around at home. This is one of our favorite DIY mermaid tiara tutorials for a good reason – it shows you how to transform a dollar store plastic tiara into this wonderful masterpiece, which is perfect for your next mermaid-inspired photo shoot. 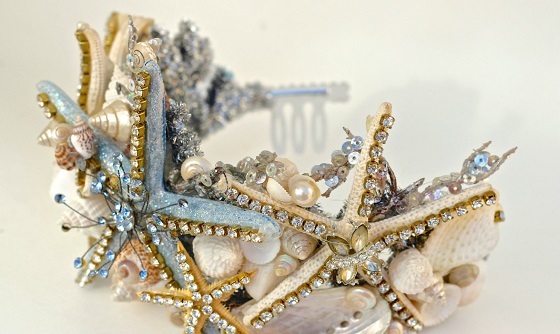 So even though this crown from Debi’s Design Diary looks expensive, you can be assured that materials include pipe cleaner, hot glue, fake star fish, shells, and embellishments of your choice. If you can’t find any of these materials at a local craft or dollar store, then be sure to check out eBay or Amazon. 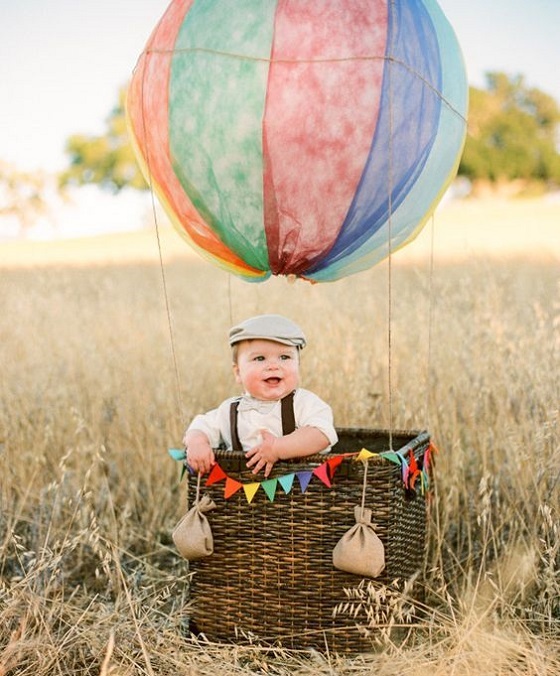 “I started with a 36″ round, white balloon and used organza I purchased from Shindigz party supplies in colors from the rainbow for the balloon cover. I took each color and sewed together strips to fit around the balloon and gathered them at the top and bottom. Then I used twine to secure the balloon to the basket, that I got from Pottery Barn. I used a rainbow felt pennant banner around the top of the basket and sewed small sand bags out of burlap for each of the four corners. I added a thick blanket to the inside of the basket for comfort and support and we were ready for our first balloon ride!” Very clever indeed! If you’ve ever spotted these gorgeous lace crowns in portraits of newborns and wondered how you can make your own, wonder no more! This brilliant DIY tutorial from My Someday in May will show you the step-by-step process, whilst sharing with you exactly what materials you’ll need. 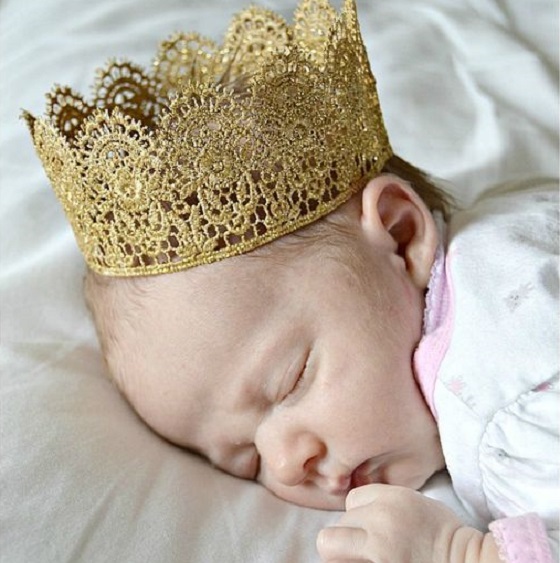 You can also see some examples of images she has taken of a newborn wearing this glittery, gold crown. 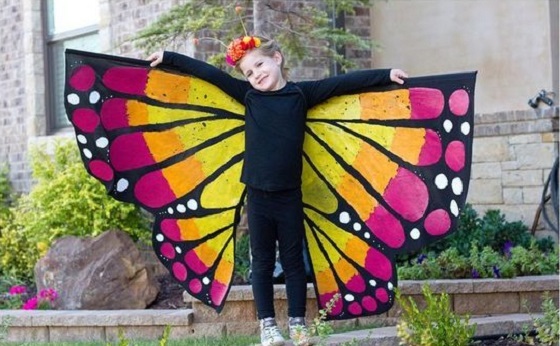 This crafty costume consists of two large butterfly wings, making this the perfect accompaniment to a child photography session. The vibrant colors will transform your images to a whole new level and your clients will truly cherish your stunning results! You’re sure to have a ball making this DIY costume from Make It & Love It and don’t forget that you can also customize your own design by choosing different colors or patterns. This DIY crystal crown from Threadsence is both ethereal and other-worldly, making it the perfect prop for any dreamy fashion shoot. You can easily source a whole bunch of quartz crystals (try eBay or Amazon if in doubt!) and then all you’ll need is some wire to construct the actual crown. Too easy! We can think of a number of beautiful photo shoot ideas where an oversized rose just like this one would come in handy to transform your photos and take them to a whole new and gorgeous level. This one is made from paper, meaning that it is both inexpensive to create and relatively simple – no tricky materials to source here! You can find the full DIY instructions from Green Wedding Shoes. Next time you’re thinking of planning a unique photo shoot, why not create one of these beautiful DIY photography props? 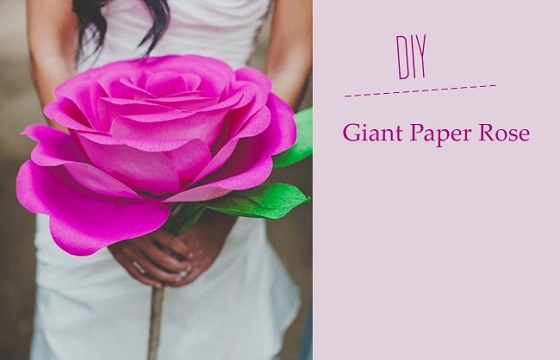 We hope that we have inspired you with these incredible and unique do-it-yourself ideas! 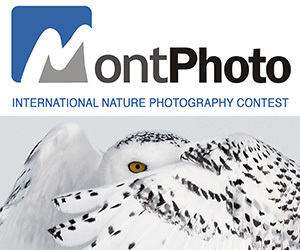 JOIN OVER 100,103 and receive weekly updates!